Will Apple shares reverse their recent decline, or continue falling? Sales guidance, iPad sales and offshore cash plans are among the things investors will be watching as the tech giant reports December quarter earnings. As Apple (AAPL - Get Report) gets set to report what should be record December quarter sales and profits on Thursday, there's a lot more tension surrounding the report than there was at the start of January. That's thanks to a flurry of reports pointing to iPhone X order cuts and/or slowing demand. TheStreet will be hosting a live blog to analyze the numbers and earnings call after the close today; please check our home page then for more information. Two of the latest reports have come from The Wall Street Journal and Japan's Nikkei. Both indicate that Apple, which does sometimes place steep initial orders before paring them back, had cut its iPhone X production forecast for the first three months of 2018 by half to about 20 million. The WSJ added Apple had "cut orders for components used in the iPhone X by 60%." Also, chipmaker Broadcom (AVGO - Get Report) , though forecasting strong April quarter sales on the back of healthy data center, storage and broadband demand, said it expects a "greater than seasonal decline" in wireless chip sales during the quarter. Apple is easily Broadcom's largest mobile chip client. But with Apple shares now down about 7% from their Jan. 18 high even as the Nasdaq has surged towards 7,500, some of this is now priced in. As a result, if Apple can avoid confirming worst-case iPhone X fears while showing healthy growth in other areas, the market's reaction to a less-than-stellar report might not be that bad. This column has been updated from Jan. 29 to mention recent reports about iPhone X order cuts, as well as Broadcom's guidance update. In addition, consensus estimates have been updated. 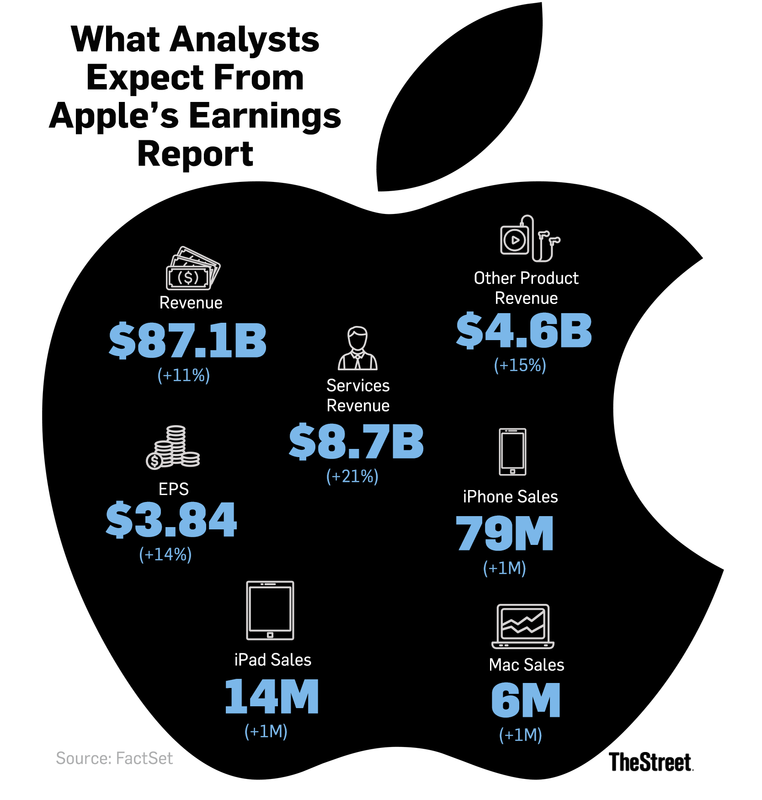 On average, analysts polled by FactSet expect Apple to report quarterly revenue of $87.39 billion (up 11% annually) and GAAP EPS of $3.85 (up 14%). iPhone, iPad and Mac unit shipments are forecast to total, respectively, 79 million, 14 million and 6 million. Chances are that Apple's December quarter numbers will be solid, given strong early demand for the iPhone X, reasonably good iPhone 8/8-Plus demand and the momentum seen as of late for various other businesses (iPads, Macs, Apple Watch, services). But given all of the media and analyst reports that have piled up regarding iPhone X sales pressures, as well as the downbeat commentary that companies such as Verizon (VZ - Get Report) and Taiwan Semiconductor (TSM - Get Report) have provided about smartphone demand, there's a lot of concern about sales guidance. That said, the analyst consensus for March quarter sales has already dropped by $3.2 billion since Jan. 10, and (given all of the negative news flow) it's possible that the "whisper" number is lower still. At $65.71 billion, the current consensus still implies 26% sales growth relative to a depressed March 2017 quarter. In September, Apple made the surprising decision to keep the iPhone 6S and 6S-Plus around at $100 discounts -- they now sport starting prices of $449 and $549, respectively -- rather than discontinue them as had been the custom. The company also kept the iPhone 7 and 7-Plus around at $100 discounts, as per usual, and cut the iPhone SE's starting price by $50 to $349. All of that positions Apple well to grab some mid-range smartphone share from Android rivals, and in doing so grow an iOS installed base that it can monetize via services. That's particularly the case in emerging markets -- Apple's September quarter sales to emerging markets outside of "Greater China" were up 40% annually, with the iPhone driving much of the growth. The December quarter is a seasonally huge one not only for the iPhone, but also the iPad and the Apple Watch. And this time around, demand is expected to get a boost from a couple of recent product launches. For the iPad, it's the September launch of iOS 11, which brought with it a number of multitasking features meant to strengthen the iPad Pro's appeal as a notebook alternative. For the Apple Watch, it's of course the launch of 4G-capable models in September -- reviewers have had mixed feelings about 4G performance and battery life, but generally like the third-gen Watch otherwise. As it is, both iPad and Apple Watch sales were pretty solid during the September quarter. iPad revenue rose 14% to $4.8 billion, with unit sales rising 11% to 10.3 million. Apple Watch unit sales rose over 50% -- as usual, no number was provided -- and helped Apple's total "Other Products" revenue, which also covers Apple TV, headphone, accessory and iPod sales, rise 36% to $3.2 billion. With the help of favorable comps -- sales had been down 30% during the Sep. 2016 quarter -- Apple's Greater China revenue returned to growth during the Sep. 2017 quarter, rising 12% to $9.8 billion (19% of total revenue). Was Apple able to keep the momentum going in the December quarter? The Greater China revenue consensus is at $17.7 billion -- that's up 9% annually, but still below the $18.4 billion Apple recorded during the Dec. 2016 quarter. KGI Securities and others have signaled that Chinese iPhone X demand has been hurt by steep local prices (Apple's flagship sports a $1,200-plus starting price on the mainland). On the other hand, Apple's attempts to grow mid-range iPhone sales likely gave a boost to its Chinese revenue, and the company reported seeing strong September quarter iPad, Mac and Services revenue growth in the country. On Jan. 17, Apple said it would pay $38 billion in taxes to repatriate offshore cash, thanks to the recent passage of a tax reform bill that allows offshore funds to be brought home at a 15.5% tax rate. This suggests Apple will be repatriating $245 billion, and keeping $207 billion net of tax payments. With Apple quite capable of financing any internal investments via its massive free cash flow (FCF totaled $51.1 billion in fiscal 2017), the billion-dollar question is how much of the repatriated cash will be directed towards capital returns and debt repayments, and how much will be directed towards M&A. Speculation that Apple could use a large chunk of its cash on M&A is easy to find -- Tesla (TSLA - Get Report) , Netflix (NFLX - Get Report) and traditional media firms such as Disney (DIS - Get Report) are often raised as possibilities. Apple typically announces changes to its capital return program at the time of its April quarter earnings report. But given the unusual nature of the current situation, it could share a detail or two about its future dividend and buyback plans on the December quarter call. Likewise, the company could offer some general thoughts on whether all that repatriated cash has made it more open to a big acquisition.